We're pretty much in a 10-year bull market. 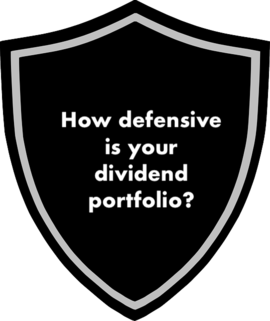 Are you looking to be more defensive in your dividend portfolio? Companies with a track record of stable earnings and cash flow are more defensive. Check for dividend safety, debt levels, and valuation. The U.S. market has been led by the bull for pretty much 10 consecutive years. So, it's better to take a more defensive stance to prepare for attacks from the bear. 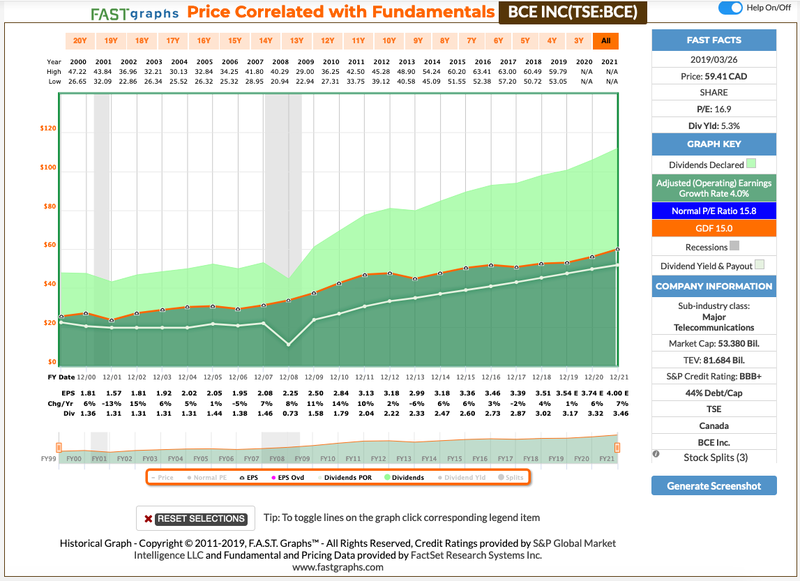 A core component of a defensive portfolio is it can utilize conservative dividend stocks as its foundation. 3 of the top 5 stocks with the longest dividend growth streaks in Canada are utilities. The top two are regulated utilities, Canadian Utilities (OTCPK:CDUAF, TSX:CU) and Fortis (FTS, TSX:FTS), which have increased their dividends for about 45 consecutive years. Utilities offer essential products and services such as electricity and gas, which have demand throughout all economic cycles. Therefore, utilities generally report stable earnings, especially for these two companies that are largely regulated with predictable returns on equity. Of course, there is no shortage of utility stock choices in the U.S. Among the largest U.S. utilities are NextEra Energy (NEE), Duke Energy (DUK), Dominion Energy (D), and Southern (SO). Unfortunately, the stocks have run up lately, and are largely offering yields that are at the low end of their historical range. REITs can generate predictable funds from operations ("FFO"), essentially a cash flow metric for REITs, which can grow at a stable rate from rent increases. REITs that are managed well offer growing cash distributions to its shareholders. The big Canadian banks and telecoms operate as an oligopoly in Canada, such that they typically generate stable earnings, and as a result, offer stable dividends that tend to increase. 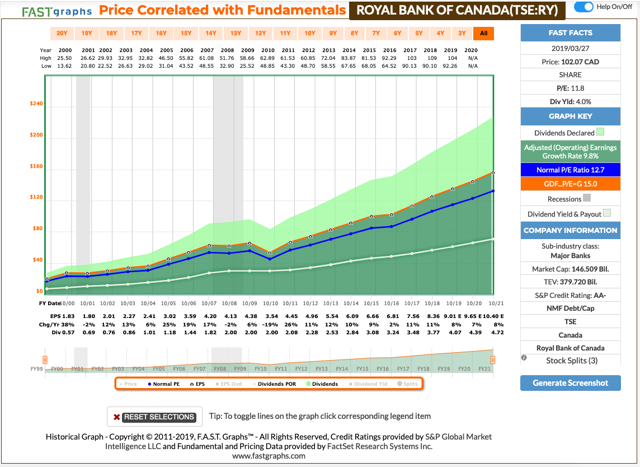 The graph below shows the earnings history of Royal Bank of Canada (RY, TSX:RY). It illustrates earnings that are stable, durable, and growing over the long run. BCE's (BCE, TSX:BCE) earnings history also illustrates durable earnings generation. Notably, the Canadian telecom leader slashed its dividend by half in 2008, but it wasn't due to a recession. At the time, BCE was going through a privatization (most likely because the stock was trading at a fabulously cheap P/E of about 11). In the end, the privatization transaction was dropped. Since then, the telecom has been diligent in hiking dividends. 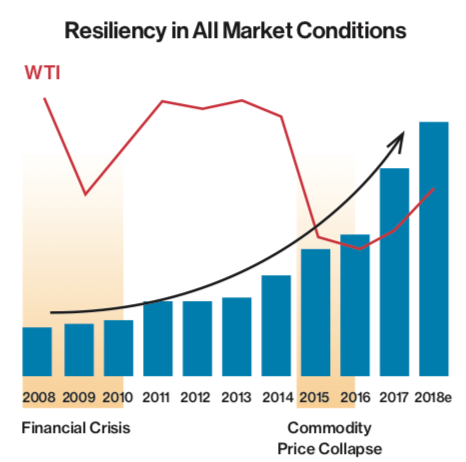 Energy infrastructure stocks tend to generate stable cash flows from largely regulated or long-term contracted assets. Enbridge (ENB, TSX:ENB) is an essential part of the North American energy industry. It transports 22% and 25%, respectively, of North America's natural gas and crude oil. The EBITDA has been stable or growing throughout tough economic times and weak oil prices. TransCanada (TRP, TSX:TRP) has a similar story. Its comparable EBITDA climbed from about CAD$5.5 billion in 2014 to CAD$8.5 billion in 2018. However, certain industries like REITs and utilities tend to have higher payout ratios. So, it's best to compare a company's payout ratio to that of its industry peers. For example, the Big 5 Canadian banks tend to maintain a payout ratio of about 50%. The table below shows Royal Bank with a rock-solid dividend track record. The Big 5 Canadian banks maintained their dividends even during the last financial crisis. Royal Bank's conservative payout ratio remains below 50%, which aligns with that of the industry. The payout ratio gives a big buffer to withstand future crises. Continuing on using Enbridge as an example, it has about 2.02 billion shares outstanding. Based on its quarterly dividend of CAD$0.738 per share, the company will pay out just under CAD$6 billion of dividends this year. 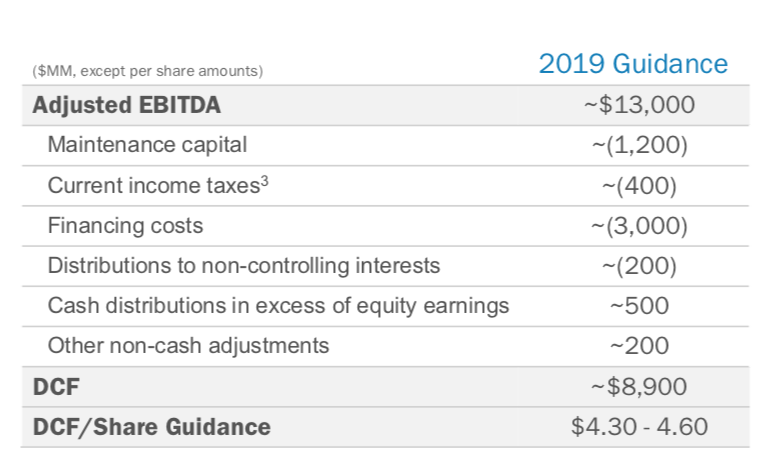 In its March presentation, Enbridge estimated to generate about CAD$8,900 of distributable cash flow ("DCF") this year, which implies a payout ratio of 67%. This is not far off from the company's target payout ratio of under 65%. Enbridge currently forecasts DCF and dividend growth of 10% for 2020, and DCF per share growth of 5-7% (from organic growth) beyond 2020. So, it's conservative to assume dividend growth of 5-7% beyond 2020. 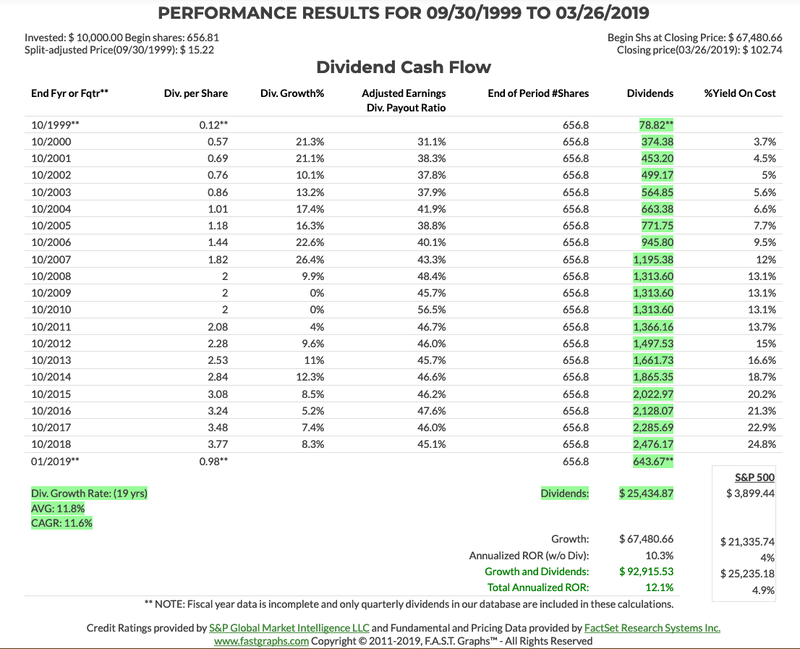 Sometimes, even when a company has a seemingly sustainable payout ratio and a strong track record of paying dividends, it can still cut its dividend because of its debt load. An investment-grade company with, say, an S&P credit rating of "BBB-" or better is a good start. Enbridge and TransCanada are awarded an S&P credit rating of "BBB+". However, their debt levels may scare away some investors. Typically, the higher the weighted average interest rate, the riskier you can assume the stock to be. Because we know there will be a market downturn in the future from a global economic slowdown or other reasons, for a defensive dividend portfolio you might choose to own a bigger percentage of dividend growth stocks with higher yields of 3-6% over ones with yields of less than 3%. It seemed fairly recently that pundits were all doom and gloom about retail REITs. Look how fast the table has turned for these REITs since the Fed has turned dovish. Quality retail REITs have experienced some strong price action as of late; National Retail Properties (NNN) and Realty Income (O) have climbed about 45% since April 2018. Both REITs look expensive. 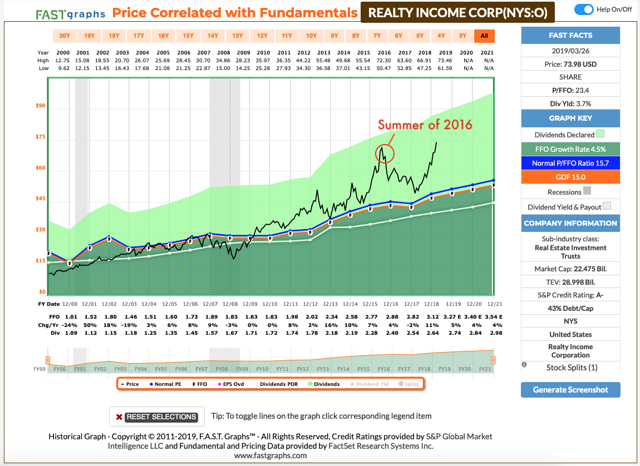 Below is the fundamental analysis graph of Realty Income, which indicates it trades at dangerously expensive levels compared to its long-term normal multiple. Although Realty Income's FFO has been very stable and the stock is conservative in that respect, it's not conservative (perhaps even risky!) when considering its valuation. And we saw what happened to the stock last time when it was dangerously expensive in the summer of 2016. The 10-year bull market and the market correction from October-December 2018 may have nudged some investors to take a more defensive stance in their dividend portfolios. Now's a good time to review your dividend portfolio, stock by stock, and check off (or not) on the items of stable earnings or cash flow, dividend safety, debt levels, and valuation. For the stocks that aren't as defensive as you think, you should think of an action plan. Something else to review is how much of your portfolio is in total returns stocks which don't focus on income generation - i.e., stocks that have low yields or none at all. And determine if you're satisfied with their allocation (individually and as a group). If not, what changes would you make? How are you making your portfolio defensive? Anyone still taking an aggressive stance out there? 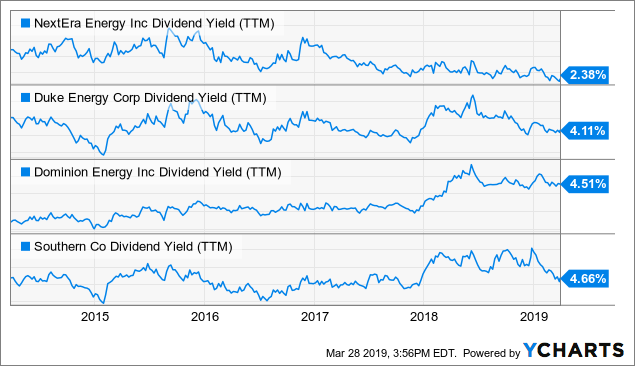 DGI Across North America subscribers get a range of dividend ideas - some are core holdings and some are mispriced stocks for trading for outsized gains. Brookfield Business Partners is one of the stocks we’ve looked at, and we look for better opportunities in the service. Disclosure: I am/we are long ENB, TRP. I wrote this article myself, and it expresses my own opinions. I am not receiving compensation for it (other than from Seeking Alpha). I have no business relationship with any company whose stock is mentioned in this article.